The New York law firm of Rubin & Licatesi, P.C. launches an improved website to make it easier than ever to connect with an experienced no-fault, personal injury or real estate lawyer. Our website provides a better overall experience to our visitors. Not only is it easier to navigate, but we have also added several pages of frequently asked questions to make information more readily available to anyone looking for answers. The Garden City, NY law firm of Rubin & Licatesi, P.C. announces the launch of an improved website, providing a valuable online legal resource to current and potential clients. The site offers helpful information to remove some of the fear and uncertainty from the legal process, including basic information on New York personal injury, no-fault and real estate laws. Website visitors learn how the New York personal injury, no-fault and mortgage foreclosure defense lawyers can assist them with their legal issue. The firm has developed a reputation for maintaining high ethical standards while aggressively representing clients throughout New York in personal injury, no-fault and real estate legal matters. About Rubin & Licatesi, P.C. Serving clients from their main office in Garden City, NY the firm is dedicated to defending the rights of individuals and healthcare practitioners throughout all boroughs of New York City, including Nassau, Suffolk, Rockland and Westchester counties. 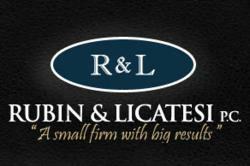 For the convenience of their clients, Rubin & Licatesi also maintains a satellite office in Brooklyn, NY. The improved website explains each practice area offered by the firm in greater detail. It also shares biographical information for each attorney at the firm. The lawyers at Rubin & Licatesi, P.C. founded in 1981, present legal representation to those seeking assistance with personal injury and no-fault cases, mortgage foreclosure defense and real estate matters. For more information, please call the firm or visit their website at http://www.rubinlicatesi.com/.